NASA managers stopped the shuttle Atlantis' countdown early today and put launch on hold for at least 24 hours because of problems with one of the ship's three electricity producing fuel cells. Engineers are continuing to troubleshoot the issue in hopes of getting Atlantis off the ground Thursday or Friday, the end of the current launch window. NASA's Mission Management Team plans to meet later today to discuss repair options. It may be possible to press ahead with launch Thursday or Friday if the engineering community can get comfortable with the apparent internal short that was observed when fuel cell No. 1 was powered up earlier today. 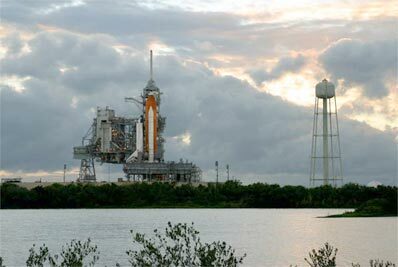 But if not, and if the powerplant cannot be repaired at the launch pad, NASA could be forced to haul Atlantis back to its hangar for a fuel cell swap out, a move that would delay launch several weeks. As of this writing, however, no such decisions have been made. NASA originally hoped to launch Atlantis on a space station assembly mission Aug. 27, but the flight was delayed by a launch pad lightning strike Aug. 25 and later, by tropical storm Ernesto. With forecasters predicting a 70 percent chance of good weather today, engineers were gearing up to load a half-million gallons of liquid oxygen and liquid hydrogen rocket fuel into Atlantis' external tank for a launch attempt at 12:29 p.m. But before fueling began, engineers noticed the problem with fuel cell No. 1's phase A bus, one of three power units in the device. Fuel loading was delayed pending resolution of the fuel cell problem, but engineers ran out of time and the launch was scrubbed a few minutes before 4 a.m. The shuttle's fuel cells, built by UTC Power, are located under the ship's cargo bay floor. They each weigh 255 pounds and measure 14 inches high, 15 inches wide and 40 inches long. They combine oxygen and hydrogen in a sort of reverse hydrolysis to produce electricity and, as a byproduct, water. All three must be operating normally for a countdown to proceed. "The three fuel cells operate as independent electrical power sources, each supplying its own isolated, simultaneously operating 28-volt dc bus," according to NASA's space shuttle reference manual. "The fuel cell consists of a power section, where the chemical reaction occurs, and an accessory section that controls and monitors the power section's performance. "The power section, where hydrogen and oxygen are transformed into electrical power, water and heat, consists of 96 cells contained in three substacks. Manifolds run the length of these substacks and distribute hydrogen, oxygen and coolant to the cells. The cells contain electrolyte consisting of potassium hydroxide and water, an oxygen electrode (cathode) and a hydrogen electrode (anode). "The accessory section monitors the reactant flow, removes waste heat and water from the chemical reaction and controls the temperature of the stack. The accessory section consists of the hydrogen and oxygen flow system, the coolant loop and the electrical control unit." Today's problem might have been caused by internal debris that triggered a short, sources said. If so, it's not yet clear how the vibration of launch might affect the fuel cell or whether additional problems could be expected. Fuel cells do no lend themselves to on-pad repairs and if the problem in fuel cell No. 1 cannot be easily resolved, engineers could be forced to remove the shuttle's payload and roll Atlantis back to its hangar so the powerplant can be replaced. That scenario likely would delay launch for several weeks. The goal of the 116th shuttle mission is to deliver and install a $372 million solar array truss, restarting space station assembly after a three-and-a-half-year hiatus in the wake of the 2003 Columbia disaster. Atlantis' flight and the next half dozen in the assembly sequence are considered among the most complex manned space missions ever attempted. Because each flight builds on the work accomplished during the previous mission, they must be conducted in sequence and any major delay could cause problems for downstream missions. NASA is operating under a self-imposed requirement to launch Atlantis in daylight for photo documentation of the shuttle's heat shield and external tank insulation. The next lighted launch window opens Oct. 26 and lasts just two days. NASA managers already were in the process of reviewing the rationale for that requirement, which greatly restricts launch opportunities this time of year. The Sept. 8 end of the current launch window was defined by conflict with Russian plans to launch a fresh crew to the space station aboard a Soyuz spacecraft Sept. 18 and to return the lab's outgoing crew Sept. 29. If Atlantis isn't off the ground by Friday - and if NASA ultimately relaxes the daylight launch constraint - the shuttle could fly as early as Sept. 30 if the fuel cell problem can be resolved at the launch pad. If the flight slips to late October, a planned December flight by shuttle Discovery could be pushed into January and three critical spacewalks by the station's crew could be delayed in turn.